In today’s episode, I had the chance to sit down and have a great chat with 4 X World Champion and 2008 Beijing Olympic bronze medallist, Donny Robinson from the USA. Donny competed professionally in BMX racing (that’s Bike Motorcross Racing), for 17 years. Donny’s fighting spirit and never give up attitude allowed him to excel on the world’s stage becoming one of the elite in his field for many years. Having won world titles in 2001 in America, 2006 in Brazil and 2009 in Australia, as well as bronze medal in the Beijing Olympics, Donny gained much deeper insight in regards to how powerful of a role mindset plays in helping to bring on peak performance. Donny was a guest speaker at our school and an ambassador for our Bike Week campaign which was held last week. The purpose of bike week was to inspire all members of our community to be more active on their bicycles. Donny shared with students specific failures he had experienced and how he bounced back from these failures to go on and achieve many amazing things. In particular, he shared his Olympic journey and how crashing his bike in qualifying heats could’ve led to him never making it to the Olympic final and ultimately not winning his bronze medal in 2008. Being an undersized athlete, Donny has an enormous heart and his message about being bullied when he was young and always being told that he’ll never make it as an athlete had a big impact on our students across the school. Donny specially shared with students how he overcame these challenges and refused to listen to people tell him what he cannot do. Many professional athletes, once they retire, never really give back to their community or to their sport. However, Donny is a class act and has committed himself to spreading his message through his ‘How far can two wheels take you’ campaign. His message is not about riding bikes but more so about helping young people to find and follow their passions and to put in the hard work necessary to develop their skills and to create opportunities for themselves through these passions. It is important to Donny that young people not give up on their dreams and hopes because there is so much that they can accomplish in their lives. I want to thank Donny for taking the time to be on my podcast and also give a shoutout to Max Andrews, our Recreation Specialist here at KAUST in Saudi Arabia. Max was the one who had the vision to bring Donny over to KAUST and to work with our students, so a big thank you to Max. Donald Robinson (born June 17, 1983, in Napa, California, is an American professional “New/Current School” Bicycle Motocross (BMX) racer whose prime competitive years are from 1999 to the present. His moniker is “dR”, his initials. The use of the lowercase “d” for his given name is perhaps related to his relatively diminutive physical size. A past nickname, “Scrawny”, was definitely linked to his small stature, since even when very young he was the smallest child in his age group. It was given to him by Bruce Minton. Like BMX predecessors Mike Miranda and Eric Rupe, Robinson is a devout Christian. He admitted in late 2013 to suffering at least 25 concussions over the course of his career. In the same interview, he advocated for better concussion protocol at the lower levels of BMX racing. Robinson joined the board of directors of concussion-education collaborative The Knockout Project in January 2013. 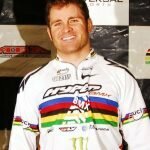 On June 25, 2008, Robinson was chosen by Mike King, team coach of the 2008 USA BMX Olympic Team, to represent the USA along with teammates Jill Kintner, Mike Day, and Kyle Bennett in BMX racing competition at the 2008 Summer Olympic Games in Beijing, China. His Olympic dream was realized at least in part when he came in third at the Summer Olympics winning a Bronze Medal executing a maneuver that saw Sifiso Nhlapo take out nearly half the field. Since it was the sport’s debut and the men’s final was run after the women’s, he became the third American and the sixth person overall to win an Olympic Medal in BMX Racing. Donny Robinson announced his retirement of the sport at the 2016 USA BMX Grand Nationals.